The Lamb’s Bread Vegan Cafe is one of the few bright spots on Main Street north of Elmwood Avenue, where vacant lots and “For Lease” signs outnumber businesses. But manager Folami Geter says it might have to move because of high renovation costs, underlining the difficulty of rebuilding such areas. Lamb’s Bread customers often linger around, the atmosphere promotes conversation. Lovers of vegan cuisine come from all over Columbia. 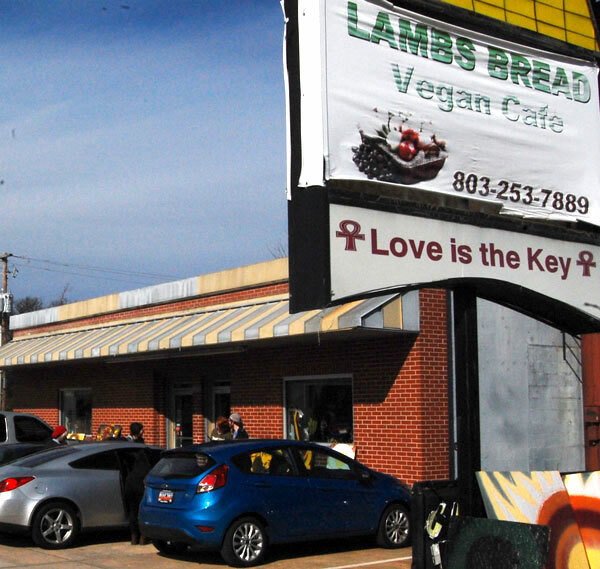 As Columbia’s north Main Street corridor struggles to revitalize, the Lamb’s Bread Vegan Cafe has been seen as the business that might get the ball rolling. It’s one of the few buildings without a “For Lease” sign along the stretch just north of Elmwood Avenue, where vacant lots and chipped, faded bricks tell of an area in decline. And though customers flock in, the Lamb’s Bread may leave. It’s been at 2338 Main St. for nearly seven years, but manager Folami Geter said the costs of renovating and maintaining the building are too much to handle. “I’m just not ready to put in the work on a building I don’t own,” Geter said. She would not discuss the restaurant’s annual revenue and couldn’t provide an estimate for the cost of cosmetic fixes and ceiling work that need to be done, but said she does have authority to make the repairs. The challenge the city faces is in providing the resources to help businesses like Lamb’s Bread create a hub of commerce that can attract other development to the area, says Evelyn Blumenberg, chairwoman of urban planning at UCLA’s Luskin school of Public Affairs. “That’s the issue in most urban areas, how do you stimulate economic activity?” she said. The fading, unlit sign and the nondescript brick storefront do little to set the Lamb’s Bread apart from neighboring buildings. About the only hints of the vibrant atmosphere inside are the colorful paintings beside the door and the loyal customers walking in and out. Columbia provides tax deferrals, forgivable loans and grants for businesses like the Lamb’s Bread trying to renovate older buildings, said John Fellows, the city planning and development staff member overseeing the North Main Corridor design. Geter said she hadn’t heard about any of those programs. The Lambs’ Bread Facebook page. That was the hope for the Lamb’s Bread, but along with the cost of fixing the current location, areas like the Vista and Five Points are enticing because they have more foot traffic and attractions to pull people in, Geter said. Walkability is essential to attracting and keeping businesses, said Tomas Schurch, a professor of urban planning and landscape architecture at Clemson University. Making crosswalks attractive and safe and making the street beautiful are key to fostering a successful neighborhood, he said. Fellows says he is trying to address this issue and is helping to negotiate a pedestrian master plan that will promote safer walking and biking throughout Columbia. So far, Columbia has invested $340,000 in facade improvements in the North Main Corridor, said Gerry Lynn Hall, who works with the facade program out of the city’s Office of Business Opportunities. But Blumenberg said appearances aren’t necessarily the best way to measure economic success in an area like North Main. “Do you look at whether the neighborhood has a grocery store or whether there’s a decrease in poverty?” she said. Chris, who declined to give a last name, preps a car for sale at the Desirable Automotive used-car dealership next to a vacant, rundown building. Businesses in this area struggle against unattractive surroundings to attract customers. In the case of incentive programs, Fellows said he measures success in the number of buildings restored. If the buildings contain businesses, the incentives are successful if they create jobs, he said. While there has been some development in the stretch between Elmwood Avenue and River Drive, nothing really big has located there, Fellows said. Lisa DuCom, the manager of If It’s Paper, moved her business from Main Street to Gervais Street near Harden in 2012. She said the building on Main was “just falling apart” and that she has gotten more exposure on Gervais, where she is between the downtown core and the Five Points entertainment district. She, like Geter, said she wasn’t aware of the city’s incentive programs. Though Geter said about 60 percent of the Lamb’s Bread customers come from the surrounding Cottontown-Bellevue neighborhood, she’s still strongly considering moving the restaurant to Five Points or the Vista even now knowing about the city’s incentives to stay. Hall said she hadn’t spoken to Geter about the facade program or any of the city’s other incentives because she had spoken to the previous manager of Lamb’s Bread in December 2012. In addition to having the information on its website, the city uses on-site visits, post cards and newspaper announcements to help spread the word, she said.